On this date in 1884, a French expeditionary force’s summary battlefield executions marked its retreat from an ambush — and the approach of the Sino-French War. Having established a foothood in south Vietnam (Cochinchina), France was pushing into north Vietnam (Tonkin) — a campaign that could open a potentially lucrative route straight into China. For the same reason, China viewed Tonkin as its own security zone. 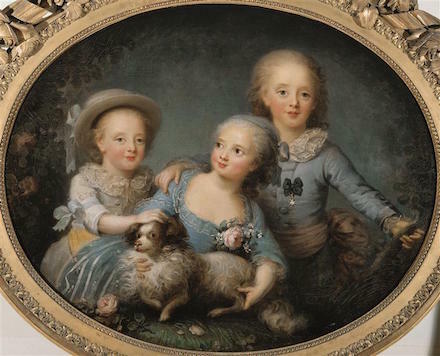 The ensuing skirmishes had as we lay our scene been recently abated by the Tientsin Accord* — an accord on France’s terms, since she had lately enjoyed the run of play in the field. One of those terms was Chinese withdrawal from Tonkin, and as one might expect the Chinese had little appetite to speedily effect such a submission. In June 1884, when a small French column commanded by a Lt. Col. Alphone Dugenne pushed into what was supposed to be France’s new satrapy, it expected to occupy undefended towns. 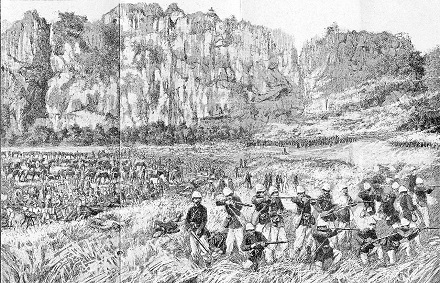 Instead, on June 23, having forded the rain-swollen Song Thuong River, Dugenne’s force encountered Chinese regulars manning a chain of clifftop forts. 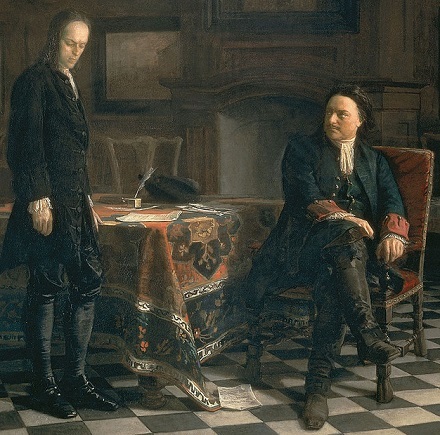 A delegation under flag of truce informed Dugenne that China’s commander was aware of the Tientsin Accord, but had received no superior orders to withdraw. This obviously put both forces in an uncomfortable position. The Chinese wanted time: was this a good faith sorting-out (the Tientsin arrangements were barely six weeks old), or a double game? When the eventual winners wrote the history of events, they called what ensued June 23-24 the Bac Le ambush. 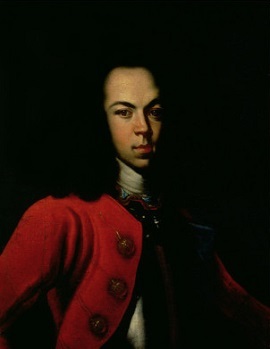 Believing that he had an arrangement with his opposite number, Dugenne’s column moved ahead on the afternoon of the 23rd, in a defile ominously commanded by the Chinese positions. Suddenly — and accounts from the two sides each accuse the other of provoking the first shots — the French came under Chinese fire. “Every tree, every overhanging rock, concealed an invisible enemy, who, being perfectly under cover himself, safely inflicted death all around him,” our correspondent’s account runs. Illustration of the Bac Le ambush from Le guet-apens de Bac-Le by a French officer who survived it, Jean-Francois-Alphonse Lecomte. 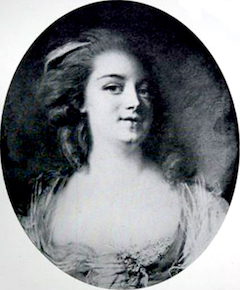 Dugenne reached friendly forces safely, and with him accounts of a “massacre” that would incense public opinion in Paris. China’s refusal to meet the ensuing French demands for satisfaction in this affair would by August trigger open war in Tonkin. * Not to be confused with 1885’s Treaty of Tientsin, which actually ended the Sino-French War. 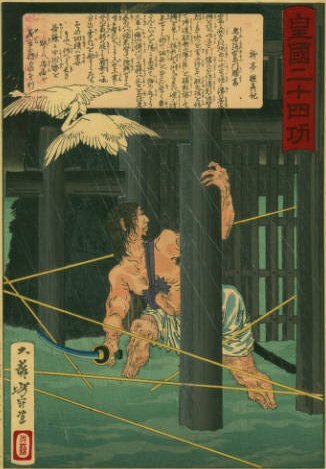 On this date in 1575* a Japanese soldier was crucified under the walls of his castle … and entered his country’s folklore. 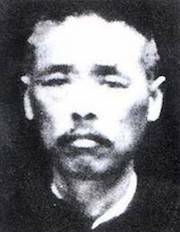 Torii Suneemon was a footman of the Okudaira family late in Japan’s fratricidal Warring States Period. The Okudaira, allies of the wars’ eventually-victorious Tokugawa clan, found themselves besieged by the Takeda. This would result in the important Battle of Nagashino. Kurosawa’s masterpiece Kagemusha imagines the Takeda where the (real) late daimyo Shingen was succeeded after his (real) 1573 death (fictitiously) by an imposter thief posing as the great commander. In the film, the imposter is unmasked and deposed, but witnesses the climactic Battle of Nagashino … and then makes a futile charge under the Takeda banner after that side is slaughtered. After an initial Takeda attempt to take the fortress by storm, the Takeda settled in for a brief siege — knowing the defenders to have only a few days’ supplies on hand. Enter Torii Suneemon. Under cover of darkness on the night of the 22nd-23rd, Suneemon slipped out of the Yagyu gate and picked his way through Takeda tripwires to escape the investment … and summon help. Torii Suneemon embarks on his mission: 19th century woodblock print of Yoshitoshi‘s “24 Accomplishments of Imperial Japan” series. The same artist also depicted that event in this triptych. He made it on the 23rd to Tokugawa Ieyasu and Oda Nobunaga, who upon hearing his report pledged to dispatch a relief force the very next day. Alas for him, Suneemon’s attempt to sneak back into the encircled fortress to deliver the good news was detected on the 24th, and he came as a prisoner to the Takeda commander. The Takeda prevailed upon their helpless captive to exchange his life for a signal service: approach the fortress walls and shout to the garrison that no help was on the way. This Suneemon agreed to do. The legends differ as to whether he walked on up to deliver this bogus bad news, or whether the Takeda lifted him up on a cross to impress upon their new agent the penalty for any funny business. Either way, Torii Suneemon had the last laugh: he immediately began hollering to the defenders that help was coming if they could just hang on a few more days. Torii Suneemon goes off-script. 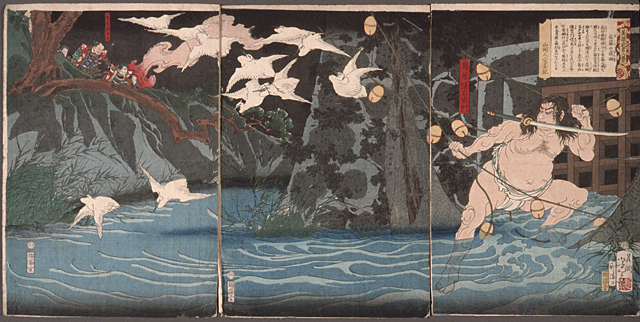 Another Yoshitoshi creation, from here or from this detailed French post. 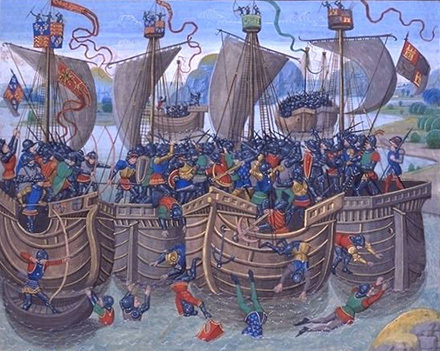 The besiegers, of course, crucified him immediately … but everyone could appreciate the doomed man’s heroism. 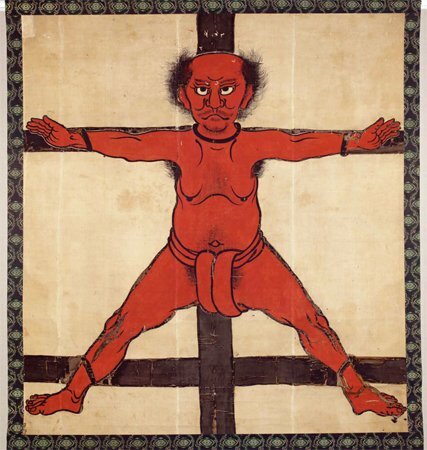 While the grateful Okudaira elevated his family to samurai rank, even an enemy Takeda commander who witnessed the event was so moved that he adopted the image of the defiantly crucified soldier for his battle standard. Heck, there’s apparently even a Japanese monument in San Antonio, Texas that compares Suneemon to the Alamo defenders. Nor was the brave soldier’s sacrifice in vain. The garrison did hold on — and their allies did relieve them, and did rout the Takeda in the resulting Battle of Nagashino. (The scenario is widely reproduced in video games nowadays). * Some sites give this as “May 16”, but I believe the primary sources here actually indicate the 16th day of the 5th month on the traditional Japanese lunisolar calendar. This date corresponds to June 24, 1575 of the Julian calendar. (1570s conversion aid in this pdf, or use this converter). On this date in 1842,* British diplomats Charles Stoddart and Arthur Conolly were summarily beheaded by a Central Asian potentate as London’s ill-chosen intervention in Afganistan came to a disastrous conclusion. The backdrop is “the Great Game”,** the long-running chess match for supremacy in Central Asia between an expanding Russian Empire and Great Britain, with its imperial position in India. Seeking to pre-empt a Russian move into Afghanistan, Britain invaded in 1839. This was the First Anglo-Afghan War: it would have, for the Brits, an inglorious end. Our day’s featured principals were among the postscript casualties of that catastrophe, never-avenged losses for an empire that had overreached itself. 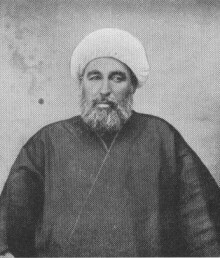 Stoddart, an intelligence officer, had been dispatched northward to the ancient silk road city of Bokhara intending enlist the allegiance, or at least the benign neutrality, of its emir, Nasrullah Khan. Today Uzbekistan’s fifth-largest city, Bokhara was then an independent state . [I]n the nineteenth century, the executions carried out there with genuine cruelty, as well as the tales told by travelers gave the city a reputation of being a forbidden, closed, and hostile place. It was “despotic” Bukhara, and the Europeans projected onto it their own oriental fantasies: with citadel, dungeons, palaces, and city walls bolted shut at night, all helping to set the scene. Scenic! Bukhara’s historic citadel, the Ark, where Stoddart (and later Conolly) were imprisoned (and later executed). (cc) image from elif ayse. Into this scene, our Brit entered clumsily, immediately irritating the ruler he intended to supplicate. 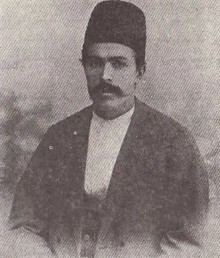 Reportedly (though the fact has been disputed), he was on the brink of execution when he acceded to save his life to Nasrullah’s formulaic offer of clemency in exchange for conversion to Islam. In any event, Stoddart languished for years, alternately imprisoned and in the custody of the (better-received) Russian mission. 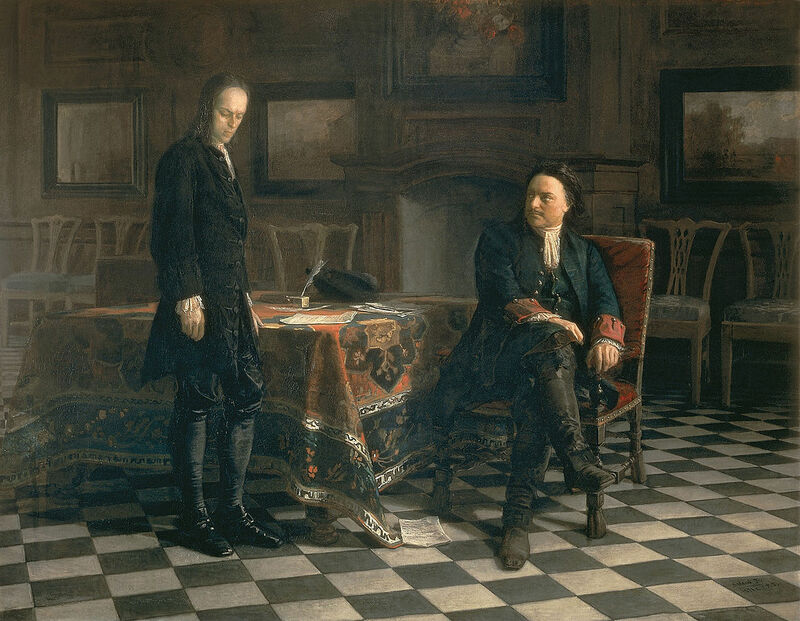 Though the latter had also been charged by its sovereign to retrieve the ill-favored English emissary as a gesture of Great Powers goodwill (and to deprive England of any rationale for intervention that his captivity might offer), Stoddart seems to have been too stubbornly prideful to get out via St. Petersburg while the getting was good. Instead, he waited on the arrival of countryman Arthur Conolly, who showed up in late 1841 on a mission to secure Stoddart’s release. But Stoddart’s situation little improved, considering Nasrullah Khan’s wary reaction to this second British interloper. Word has it that the Bukharan prince was piqued that correspondence to him did not arrive over the signature of the British monarch herself, but merely some subcontinental subaltern — as well as, we might think understandably, suspicious at his guests’ motivations and mission. The captor’s uncertain attitude towards his prisoners was resolved by Britain’s catastrophic loss of Kabul and the subsequent massacre of an entire 16,000-strong army as it attempted to retreat. Seriously, the whole army. To a man. Except for one guy. 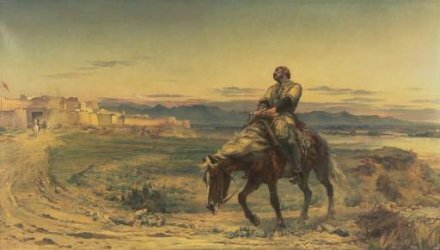 Remnants of an Army, by Elizabeth Butler, depicts the only British subject on retreat from Kabul to reach Jalalabad, William Brydon. Reasoning‡ that the routed British were now of no conceivable threat, nor his prisoners of any conceivable benefit, Nasrullah Khan now accused them of espionage and abused them with impunity. Later, finding illicit writing materials secreted on his captives’ persons, the mercurial Nasrullah disposed of them outright. their quarters were entered by several men, who stripped them, and carried them off to prison … In stripping Colonel Stoddart a lead pencil was found in the lining of his coat, and some papers in his waist. These were taken to the Ameer, who gave orders that Colonel Stoddart should be beaten with heavy sticks until he disclosed who brought the papers, and to whom he wrote. He was most violently beaten, but he revealed nothing; he was beaten repeatedly for two or three days. On Friday, the 8th or 9th (the 7th) of Jemmadee-ool-Eovel (17th of June), the Ameer gave orders that Colonel Stoddart should be killed in the presence of Captain Conolly, who was to be offered life if he would become a Mahomedan. In the afternoon they were taken outside the prison into the street, which is a kind of small square. Their hands were tied across in front. Many people assembled to behold the spectacle. Their graves were dug before their eyes. Colonel Stoddart exclaimed aloud at the cruelty and tyranny of the Ameer. His head was then cut off with a knife. The chief executioner then turned to Captain Conolly, and said — “The Ameer spares your life if you will become a Mussulman.” Captain Conolly answered, “Colonel Stoddart has been a Mussulman for three years, and you have killed him, you killed Yoosoof too; I will not be a Mussulman, and I am ready to die.” Saying which he stretched forth his neck. His head was then cut off. The veracity of this faint bulletin from a distant and inaccessible realm nevertheless remained in some doubt. Friends of the lost men, despairing of obtaining definitive word of their fate, commissioned a strange but courageous missionary named Joseph Wolff to brave his own sojourn to Bokhara to investigate. Wolff barely escaped with his own life, but seemingly confirmed the sad story and published a Narrative of his travels in 1845 (Part 1, Part 2). * The initially reported June 17 execution date was subsequently contested by Joseph Pierre Ferrier, who argued that the chronology instead pointed to the next Friday, June 24. The matter appears to me permanently unresolvable. ** Ironically, the sportive phrase “the Great Game” was itself attributed to Arthur Conolly for whom, in the end, events turned out to be quite other than playful. † Britain recaptured Kabul in reprisal later in 1842, upon which pretext it was able to declare its honor vindicated and depart Kabul (sans massacre), ending the war. Certain latter-day occupations of that “graveyard of empires” might envy their forebear’s talent for declaring victory and leaving. ‡ Correctly. Nasrullah Khan faced no British reprisal for his treatment of Stoddart and Conolly, notwithstanding the attempt by some friends to use their sad fate as some sort of casus belli. This public domain book from 1845 bears a dedication to Queen Victoria in “hope of directing your Majesty’s attention to the cruel sufferings and alleged murder of two British officers … abandoned in an unaccountable manner, by your Majesty’s Government … [in circumstances] degrading to the British nation;” the same man had previously published an “Appeal to the British Nation” in an “endeavour to excite the public sympathy.” Sympathy or no, the two British officers stayed abandoned. § Bug tortureenhanced interrogation was actually authorized during the Bush administration for the insect-averse Abu Zubaydah. The gentleman approving that technique, Jay Bybee, is now a federal circuit judge. A quarter-century ago this date, a “scared” mentally disabled prisoner named Jerome Bowden was electrocuted in Georgia for a crime many think he did not commit. While present-day DNA exonerations are fortunately forcing reconsideration of the ubiquitous problem of false confessions, Bowden’s was understandably doubted even before his execution. Asked to explain his signature on a document obviously beyond his capacity to compose himself, he gave a confused answer that seemed to indicate he’d been led to sign it by a suggestion that it would keep him out of the electric chair. Bowden’s assent to this fatal “admission” sadly evokes the characteristic eagerness to please one often encounters in the developmentally disabled — sometimes, as with Joe Arridy, to their own destruction. And even though the authorities hustled through a test the day before his execution that reckoned Bowden with an I.Q. of 65 — still solidly below the conventional threshold for mental disability, but good enough for the Georgia Board of Pardons and Paroles — the whole affair shook the state. It “unsettled more than a few persons in government and law enforcement,” the Atlanta Constitution later editorialized. brute whimsy was given full sway. For the state of Georgia, it was a willful lapse of decency. This lapse of decency rippled over the months ahead until Georgia in 1988 became the first state to enact a law barring the execution of the mentally disabled. Maryland followed suit the next year, but the U.S. Supreme Court held in the 1989 decision Penry v. Lynaugh that executing such prisoners did not constitute “cruel and unusual punishment”. While that decision was reversed in 2002, the putative ban on executing the mentally disabled in the United States remains very far from a bright line. It’s up to the states themselves to decide who falls under that definition,† and at least some have given ample indication that they’re prepared to exploit any expediency necessary to get a fellow onto death row, or keep him there. Earlier this very week, Texas (of course) put to death a man of dubious competence, Milton Mathis, essentially by cherry-picking its data and having federal appellate review barred on a technicality. A quarter-century on, those ripples started by Jerome Bowden still have a way to go. * We’ve previously featured another recording in this set of a particularly frightful botched electrocution. ** Both Constitution quotes, and the childhood IQ examiner quote, as cited in Robert Perske’s Unequal Justice?. † As an irony of its early adoption, Georgia later found itself with an unusually stingy legal standard for protecting disabled defendants from the death penalty.